If you live in a high wind area, this high quality shed might be just the perfect solution for your storage needs. This Australian made Durabuilt StormShed is one of the toughest sheds on the market. The StormSheds are suitable for cyclone regions (Region D/Category 2) withstanding wind speeds up to 88 m/s (316 kph), compiling with W60 cyclonic conditions. 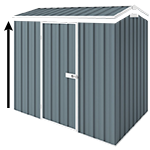 Sheds are manufactured from extra tough 0.35mm sheeting and come with high-strength ribbed cyclone frame. All anchors and fixings are provided and supplied with fully compliant engineering. The StormSheds are assembled with the EasySheds 5 Step assembly sequence and manufactured with the EdgeSAFE safety system. Shed comes with 20 year warranty. *Please note, picture is for illustration purposes only.